Weekly Zazen Weekly zazen periods are held at the Great Mountain Zen Center at Maitreya Abbey in Berthoud; the Labyrinth at First United Methodist Church in Central Boulder (Eon Zen Center); and Community Holistic Health Center in Lafayette. Beginners are welcome at all sittings. See the Weekly Practice Schedule for more information and directions. Sesshin Sesshin, an intensive retreat, includes zazen, sutra chanting, work practice, Dharma discussions, and private interviews with Roshis. Weekend sesshins are held 6-9 times a year and formal week-long sesshins are held twice a year, in June and December. Cost for a weekend sesshin is $160 for members and students, $200 for non-members. Cost for a week-long sesshin is $560 for members and students, $700 non-members. Part-time participation is allowed. See the event schedule for dates. Download an application form, and contact the Center via e-mail to register. Early registration is greatly appreciated. Information on sesshin schedule and what to bring. Introduction to Zen Introduction to Zen Practice is held the first Monday of each month at the Labyrinth, Boulder. Sign up through the Meetup. The session includes posture instruction, short sitting periods, discussion of Zen lineage. Zazenkai (All-Day Sittings) Zazenkais are held at Willow Farm Zendo in Hygiene, led by Gyodo Sensei. The schedule typically goes from 8:30am-4:30pm and includes zazen, walking meditation, work practice, lunch, and interview. Full Moon Precept Contemplation Meditations. The fusatsu ceremony, or renewal of vows, is traditionally done on the night of the full moon. 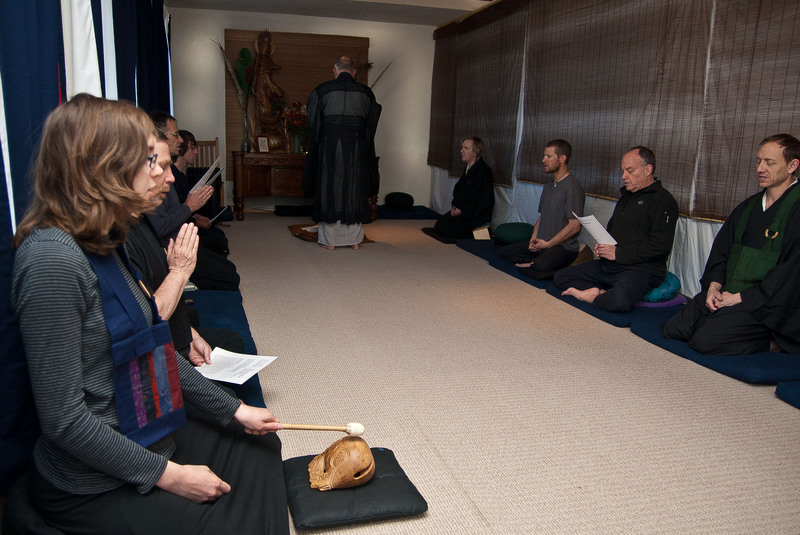 This Precepts Meditation is not as formal as the full fusatsu ceremony, and is great for people who haven’t taken lay ordination, to contemplate how the precepts might inform their lives, as well as for people who have taken their vows, in order to deepen their understanding of the precepts. Start at 6:30pm, on or close to the Full Moon (depending on the other things on the schedule). See Dates on the Events page. Sutra Readings. On the 2nd Saturday of each month, after the regular program and a break for lunch, we are offering group readings of the traditional Zen sutras, for the purpose of becoming more familiar with the teachings of the Buddha. Please bring a sack lunch if you intend to stay for the readings. Start around 12:45 and read together for about an hour. See Dates on the Events page. Great Heart Zen Practice Great Heart Zen Practice is a program that combines traditional Zen meditation with intensive workshops, aimed at uncovering how personal conditioning obstructs our experience of oneness. Ango (“Peaceful Dwelling”) Ango is a 90-day period during which all practitioners are invited to increase their commitment to practice. Ango occurs from September through the end of Rohatsu retreat in early December.